Ancient myths are fascinating for those at the third grade reading level, especially when the story is a fresh take on mythology. This interesting story will capture youngsters with comprehension at the third grade level with a story full of gods, magic, and adventure, although older readers will enjoy this as well. Mouse Bird Snake Wolf is a creation myth about a world designed by some gods who did not quite finish the job. They created a world with, a sea, a sky, and mountains. There were some people and creatures and trees and plants, but there were also many blank spaces. The gods spend their time napping and lying around the clouds having cake and tea instead of finishing their work. Some young people, Harry, Sue, and Little Ben, wondered about the blank spaces. They feel like there should be creatures to fill those blanks. Little Ben thinks there should be a mousey thing. He creates one from plants, wool, and nuts and forms them into a mousey shaped thing and conjures it into a living thing. Sue decides to try to make a birdie kind of thing, and she pulls that off as well. Harry creates a snake from mud and brings it to life. The gods snooze on and never interfere. The real trouble is caused when Harry and Sue get together and decide what needs to happen is a wolf. Little Ben tries to stop them, but they are intent on bringing their creature to life. Creation myths exist in every culture in the world. This would be a wonderful book to add to a unit on creation myths. Because it is so unusual and fresh, this will give youngsters a great starting point for writing and illustrating their own creation myths. Both the author and the illustrator have web sites. 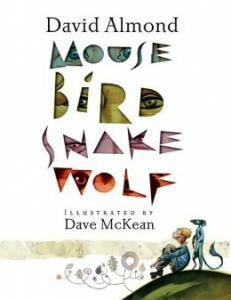 The author’s page can be found at http://www.davidalmond.com/ and the illustrator’s site is http://www.davemckean.com/.